Stable External Doors give a beautiful twist to the traditional properties. They let the fresh air flow through your home. Also, it provides a beautiful entrance to your house. 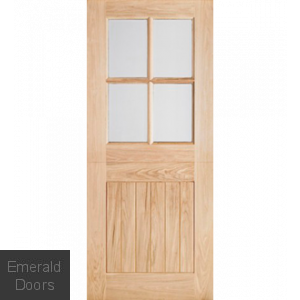 Emerald Doors supplies Oak, Hardwood, and Pine stable doors. Most of the door designs include a large section of glass paneling. This allows natural light to enter into the home. How Does a Stable Doors Open? A stable door might look similar to any ordinary door at once. But it can be split into two parts - upper and lower half and can be opened separately. This gives the users a benefit in terms of look, style, safety, and convenience. If an External Stable Door is installed at the front, then it is a win-win situation for you. Opening the upper half can help you answer to anyone at the door. Also, this provides security and does not allow strangers to crash into your house without your permission. This keeps your house ventilated with a flow of fresh air coming through the upper half. Stable doors have come a long way from being a part of the traditional architecture to the modern country style. We have maintained this tradition and style to give your house a classic and modern touch. 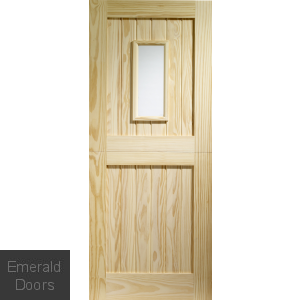 Our door designs comply with the National Quality standards. Not only the design, but we also have improved security. Now, External Stable Doors come with advanced theft-proof security and high-quality standards. Also, we provide improved frame fittings and weather sealing. Our Stable Doors are the perfect choice for homemakers. 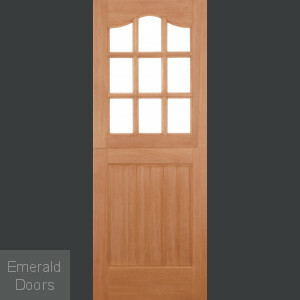 At Emerald Doors, we have a wonderful range of stable doors. 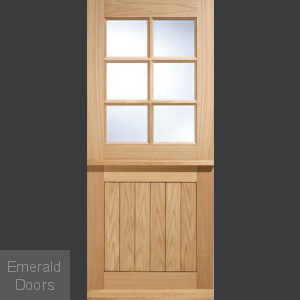 Our doors are available in all styles and sizes. We also provide customized designs and styles. 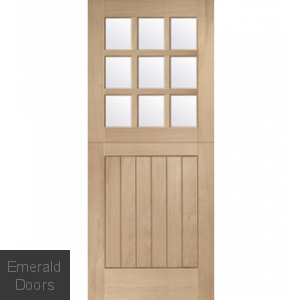 Our Stable timber doors are available in both varieties - unglazed stable doors and pre-glazed stable doors. They also include intricate details on the glass panels giving a unique look to the doors. Any style you choose, we assure you the top-quality designs, glass, and quality timber. 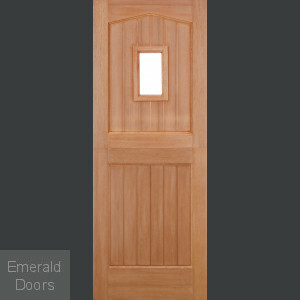 We have a range of wooden Stable doors for diverse purposes. They also come in a variety of colors. Moreover, they reflect uniqueness and style giving your house a castle-like feeling from outside. 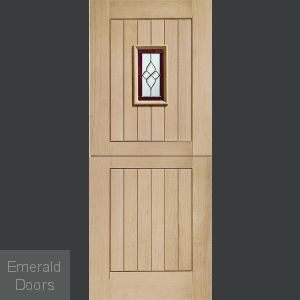 To design your ideal door, we have unique fashions and a mixture of glass designs and panel designs. We offer you a distinct combination of functionality, design, and style to our consumers online. We provide you with customizations to match the aesthetics of your classic or modern property. Our Stable External Doors can be an asset to your traditional property or modern architecture. They bring a charming entrance to your home and can be ideal for garages, terraces, storerooms, cottages and the older properties which have characters. Explore our wide collection of high-quality and security Stable doors. 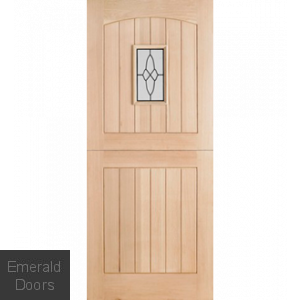 We provide doors at affordable prices in the UK and offer nationwide delivery. Contact our team to discuss more. Call our Sales Team on 0845 62 50 755.